Promoted FC Ingolstadt 04 have the chance to put nine points between themselves and the relegation places when they welcome struggling SV Werder Bremen on Saturday afternoon (kick-off: 15:30CET/14:30GMT). Ingolstadt’s form has been binary in 2016, with Saturday’s 2-0 defeat at VfL Wolfsburg punctuating a run of alternating wins and losses. Ralph Hasenhüttl’s side have nonetheless defied expectations this season, and come into Matchday 21 in 12th, potentially one win away from the top half of the table. The promotion/relegation play-off place is occupied by Bremen, who have only TSG 1899 Hoffenheim and Hannover 96 below them in the table after last Saturday’s 1-1 draw with Die Kraichgauer. 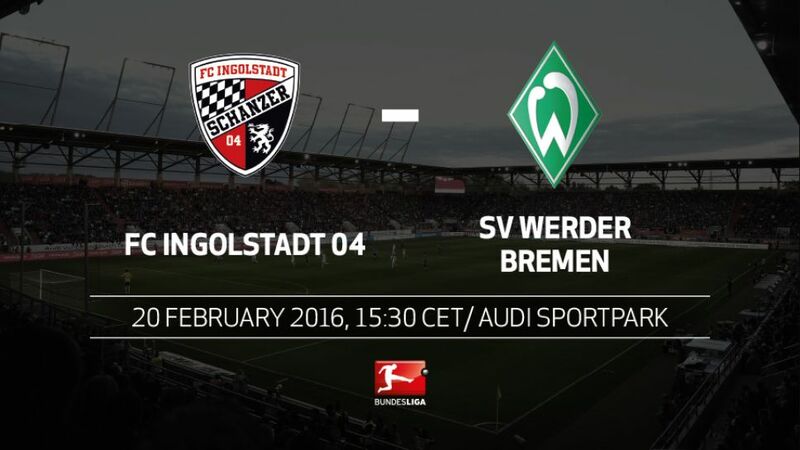 Four of Werder’s five wins this season (and 14 of their 20 points) have come away from home.This match sees the league’s weakest attack (Ingolstadt with 14 goals) come up against the division’s weakest defence (Werder with 42 goals conceded).Ingolstadt have failed to score in more than half of their games this season (11 of 21).It has been 24 games since Bremen kept a clean sheet – already a club record.Ingolstadt’s 1-0 win in the reverse fixture on Matchday 5 kicked off a run of four consecutive defeats for Werder. Havind begun the campaign with seven points from their first four matches, Bremen now find themselves in the promotion/relegation play-off place.Werder have conceded seven goals in the opening 15 minutes. That is a league record, jointly held with VfB Stuttgart.However, Ingolstadt are yet to score inside the first 20 minutes. The earliest goal they have managed came in the 21st minute, in Matchday 7’s 1-1 draw at 1.FC Köln.